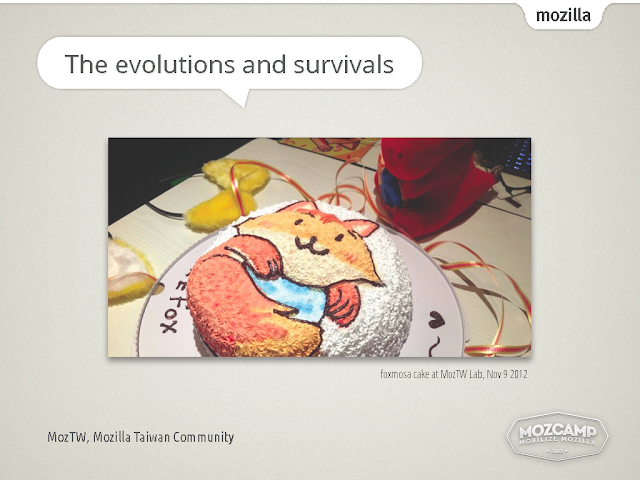 I'd just joined >MozCamp Asia 2012 in Singapore (Nov 16~18), and had a session Events of Taiwan community: challenges, evolutions, and survivals in 2012, here is the slide and my speaking draft. I hope that our experience could make some help to my beloved Mozilla worldwide community. 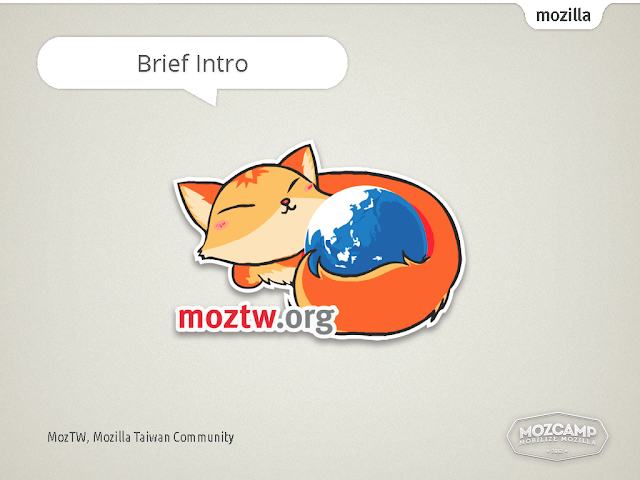 In the beginning, I'm going to give a brief intro of Mozilla Taiwan community. 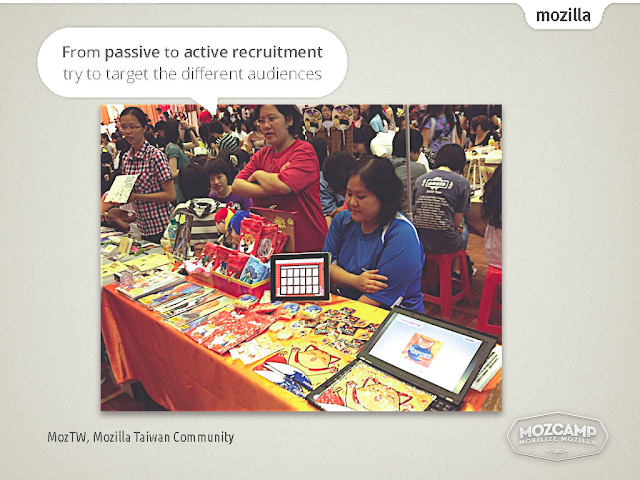 Established in 2004, making contribution by maintaining product localization and & localized product sites, MozTW turned out to be a project-oriented community: including online/offline marketing campaigns, evangelism talks, localizations, and contribution in different Mozilla projects. Before I start of the challenge part, I'm going to make a DISCLAIMER: Ideas below may or may not representing other MozTW member's idea. This is what I observed from my own contributing experience, others might not think it's a big problem, or the problem might not exist at all. As time passes, if a community doesn't grow with enough younger participation, the average age of community contributors becomes older. Also you'll find out you have no that much time after graduated, and the same situation happened across all the active folks of your community. Many of the communities are formed by a herd of college students, so you can foresee such a problem in 4~5 years if the community were newly burned in your region. I feel that the change of the browser market / OSS environment makes us harder to recruit these days. When we begin, there are only several browsers in the market, Firefox represents innovation and creativity, it's a little rebel and hacks culture, it's cool. At that time when a people wanted to join some internet interesting group and contribute in a non-programming field, you don't have so many OSS/software communities choices like today. This day there are other browsers which thinks to be cooler than the old fox across techies, the opportunity to contribute, with the spirit of the social action are much more. Take events for example, 5 years before, there were not so many events for geeks like our Firefox Party in Taiwan, I think it's easier to gather hundreds of attendees and have much attention to our campaigns, but it's much harder today. Taiwan has population about 20 millions, and In this year we have more than 10 houndries attendee conferences, subjetive on OSS and web. The growth of internet and globalization OSS projects also have some effect, one can easily find events, communities, reach and contribute remotely to non-local project. I think it's make us harder on our recruition today. We now face challenges from new "official" player on Firefox marketing / representative, and I expect company is going to grow its new community in the marketing strategy. Mozilla office in Taipei was established last year right after MozCamp, before that, we had discussed some of the problems we may face across core contributors of Taiwan. In this year, I have seen many things we were worried at that time, which I don't really want to see, resulting in much more challenges. 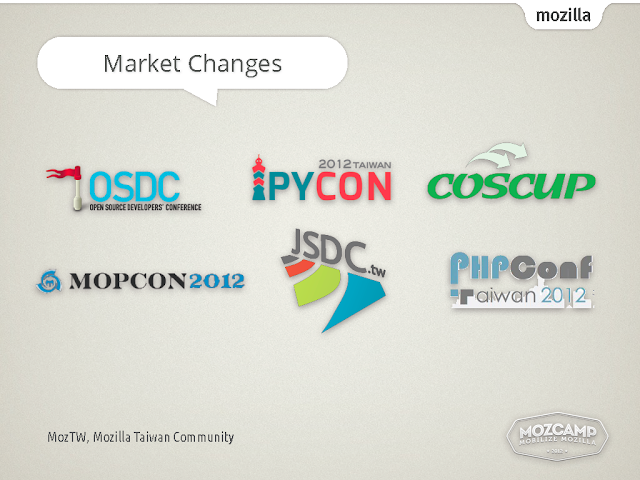 Which may happened again, if Mozilla is opening new office, then we may want to avoid them. 1. 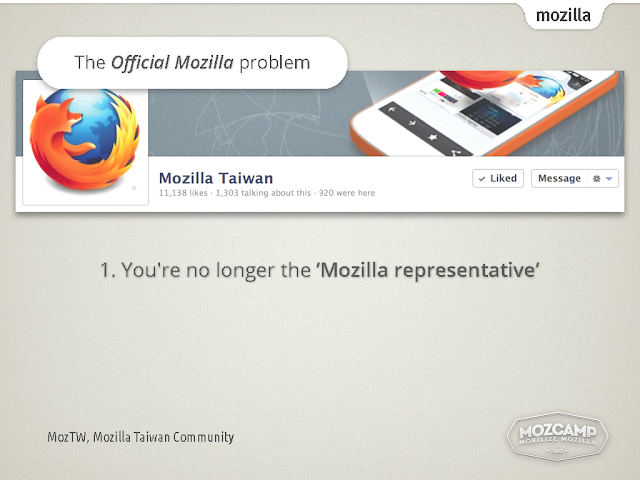 You're no longer the "Mozilla representative"
MozTW was the de facto "Mozilla representative" before. After the local company opens, when people want to contact Mozilla, they'll directly contact the company, and since it's related to end-use marketing, if the information doesn't been bounced to community, which means much less co-operation opportunities and much less eyes attracted on community. And there is a branding problem, if your community use "Mozilla-country" as your name, you may have to prepare for the naming transition, for that this is the offices' formal name. 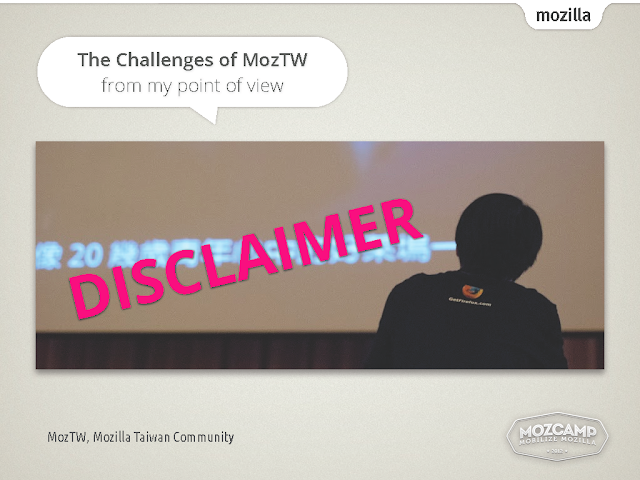 In fact, we don't really have the choice deal with this situation, this problem had been foreseen by BobChao, our previous community liaison many years ago, so we'd used MozTW and Mozilla Taiwan Community bi-branding for years. But when we actually deal with the situation today, it's still hard to come out with a good enough branding strategy, weather to promote the "Mozilla Taiwan Community" on our events? 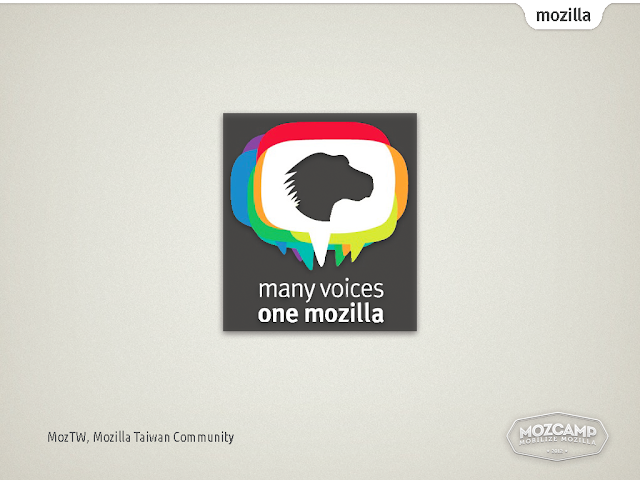 Or to use "Mozilla Community" only? 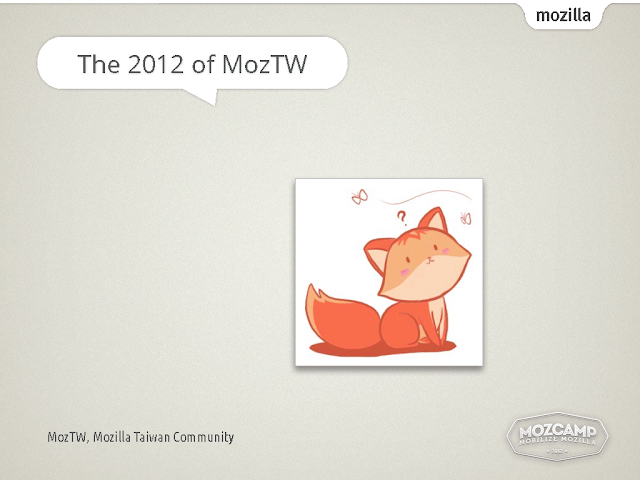 Or using "MozTW" preventing distinguish to "Mozilla Taiwan", the official name of office? As my own observing, people just couldn't understand. In fact, they don't find there is several Mozilla depart at all. Once the office is open, you may find out your hardly-working community guru to be hired, and they had much less time contribute to community projects. The better they had done before, the harmful it would be. In conjunction with the age's problem of community and recruitment problem, it'll became hardest challange you'd like to deal with. It's true that the problem will naturally begin to exist as the time pass, whether the offices open or not. 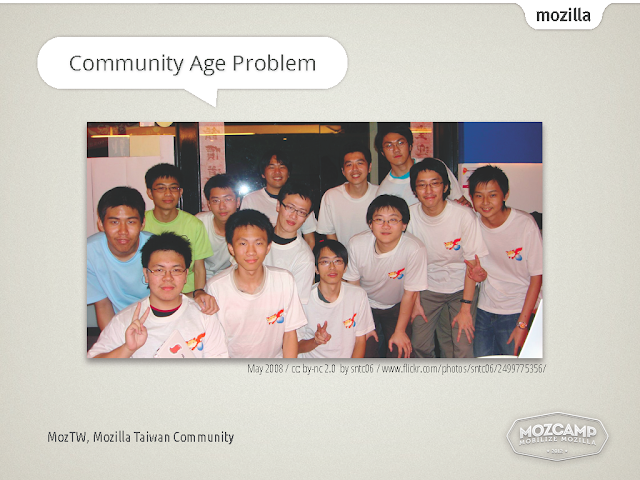 Community always lose core contributors as they graduate from school and if they are not luckily enough to find the job which can have enough leisure time to contribute, but I was hoping it may be difference when it comes to Mozilla. It's seems that it's my too idealistic wishes when our community contributors joined the local office. While the local company doing end-user promotions, as time passed, many events/campaigns rolled out one by one. You'll begin to see the competing projects to what your community were doing unavoidable. From online campaigns such as facebook pages to offline events such as workshops and speeches, I'm frustrated for that with the full time employees, engineers and budget supplement, their campaign seems eventually more successful than what communities did. <- their campaign would be probably more successful than what communities did. ?? 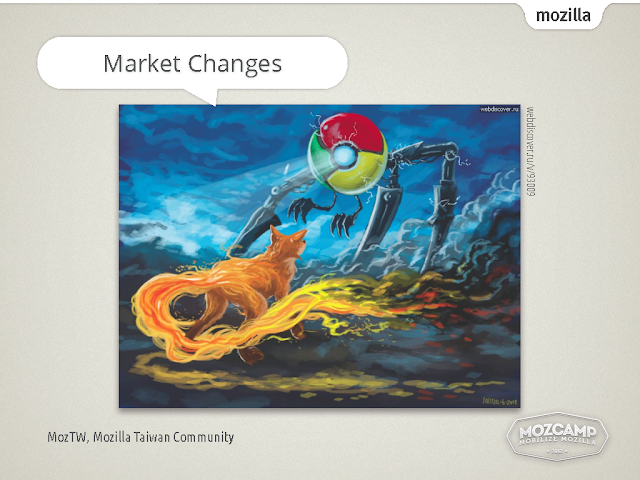 We used to translate news from Mozilla and Mozillian's blogs to a Trad. 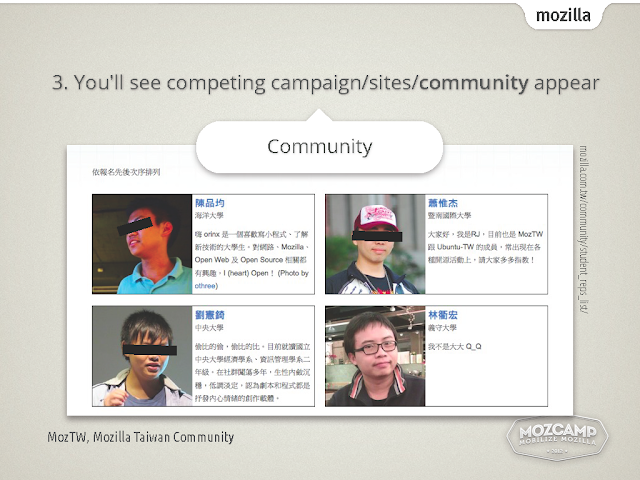 Chinese Mozilla Links, since it's a community volunteer project, we could not control the effectiveness but quality. Nowadays, when local office can publish the "latest" news in synchronize with Mozilla Press blog, that's the efficiency we can never achieve ever. How could our campaign compete with the company's similar one, for that you can only exchange your sleeping time while they're working on a daily basis? It turned to be no choice but to give up translating and spreading the news, also on many campaigns which local office may be interested in, and choose what they're not. Second is about websites. 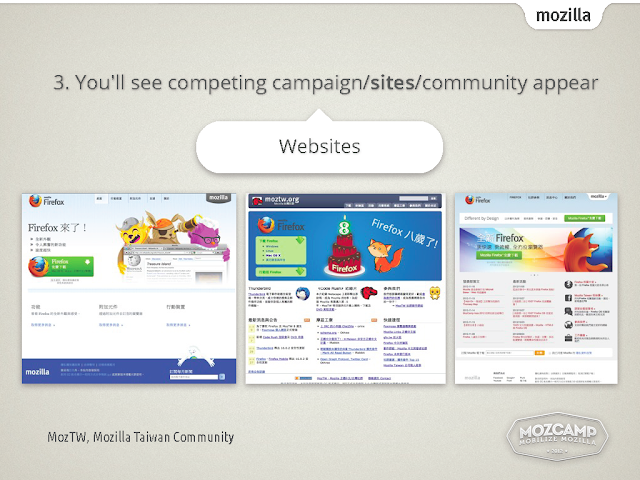 After the local company opened their site, your community portal are no longer the second Mozilla sites anymore. 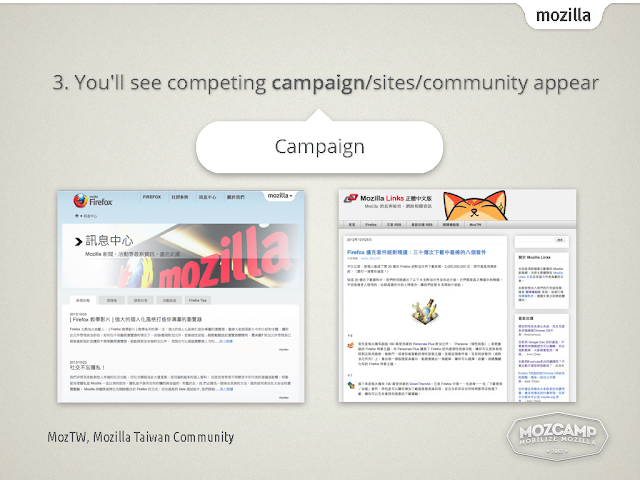 Users will see 1) localized mozilla.org, 2) local office's mozilla.com.country and 3) community's site. All 3 different sites are shared with similar contents and same propose - to spreading information about Mozilla, and the same action - to provide Firefox download. If one user could found that there are more than one site exist, he'll be frustrated with them no doubt. I think most of the users don't really figure out there are. Even further, one day you may surprisingly found that mozilla.org been redirected to local office's website, instead of the normal localized mozilla.org in your language. It has not happened on zh-TW yet, and I'll never eager to see it happened. 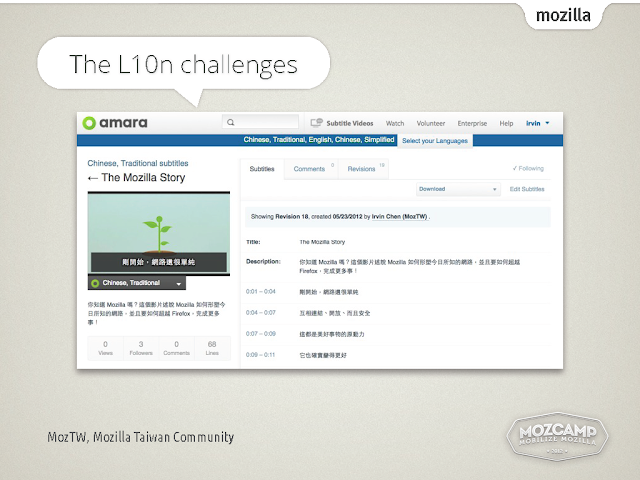 Why bother to do so when l10n contributors are taking good care of mozilla.org, when it comes to One Mozilla conception? Anything more to expect? Has your community ever built a forum? What if you found that one similar section appear at local official site? What would the originnal forum users thought? 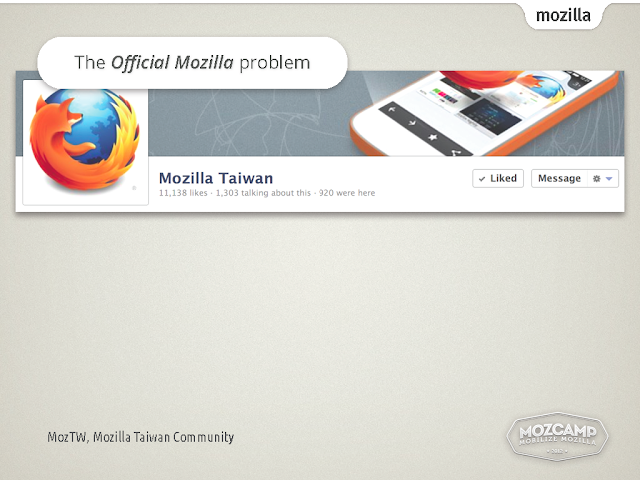 That's the best negative message from "One Mozilla" that we could convinced our users regionally. With the local company's some kinds of campaign begin, you may expect the other "more official" community begin to exist, while they started recruit volunteer/students. The worse thing is that you're still facing the recruit problem we mentioned before, and you may have to keep thinking "how to recruit new contributors on community's projects, from our already recruited local office's contributors." How weird is it. It turns to be the original community are not the only Mozilla community anymore, although it was, it's not, maybe for some employees POV. How about from the One-Mozilla POV?, the overall community is growing while your formal community weakening on behavior of above problems. It's true that our own community may not include all of the Mozillians in our region, and an alternative communities may have been running more systematically with the direct instructions from local company, and the overall perceptions of Mozilla and Firefox to audience may increasingly. But for me, the problems are more emotional than rationally. I couldn't questioned my believed methods to making Mozilla stronger. 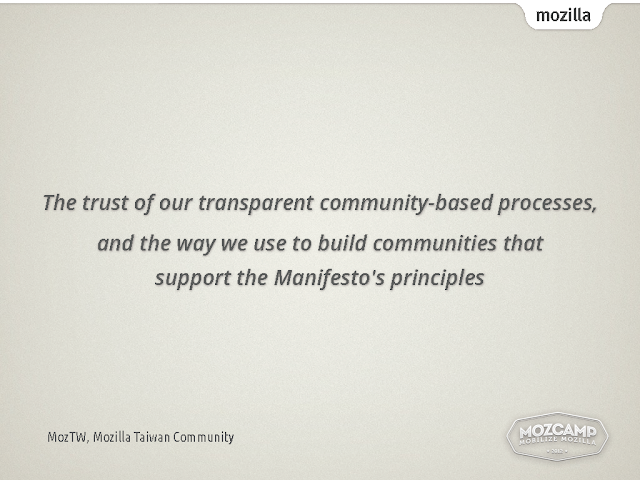 For the love of my community of which I begin to contributed, for the different expectation from Mozilla manifesto I believed in - "the trust of our transparent community-based processes, and the way we use to build communities that support the Manifesto's principles. To saw a community been weakening from above problems, I found that I couldn't be as proud to mention the openness and our community approach as I was before. In 2012, we had several offline events, such as a co-hosting Firefox-Ubuntu party in April, and Webmaker Pop-up party running joinly with local Mozilla office. We kept running weekly MozTW Lab Cafe and Gathering routined meetings continuously, for community members to gather and share with each other. It seems more people are attending regularly this year. 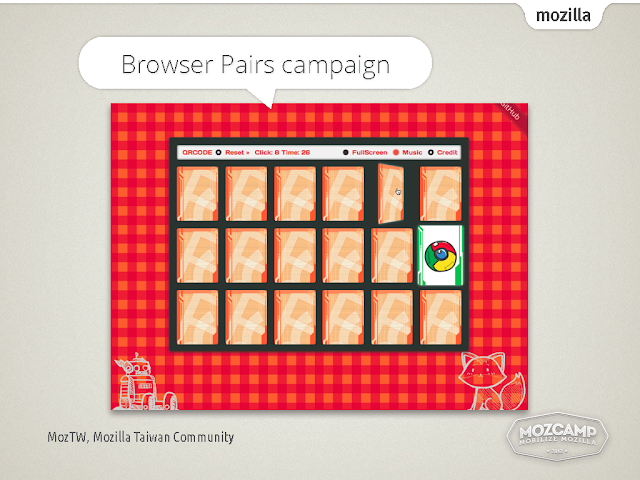 And about online events, besides regularly updating of the our portal site, our main brick-and-click campaign this year is "Browser Pairs Game" as mentioned in the earlier session by the author WM and littlebtc. We promoted Firefox for Android, the responsive design of our community sites our mascot Foxmosa and HTML5 all in one single joyful game campaign, not forgot to mention how happy to see the audience react, when they found the unique design of the game. I could not forget to thanks for the Firefox Mobile marketing team on supporting the campaign. And We're planning to keep running the campaign, also roll-out more games to promoting the mascot and the delight of HTML5, and have more fun this year. Due to the challenges I'd mention above, I believed we have to avoid doing things which the local office began to work on, that is, we have to decreasing the translation of blog article and building l10n product sites, divert our attention to other fields. One of the approach we tried is the video subtitle translation with Amara. After finish several short videos such as "A Different Kinds of Browser", "The Mozilla Story" and "Looking Ahead", we challenged to hosting a 2-day workshop translating "Code Rush". 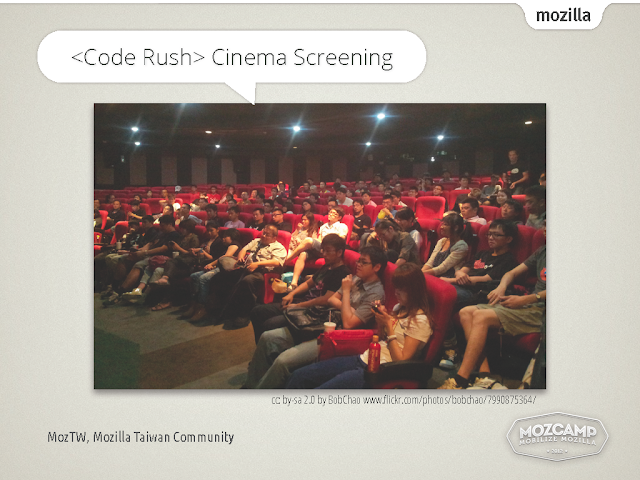 With the total attendance of about 20 contributors, and several days of over-night working on adjusting the subtitles, and with the gracefully supporting from Tara Hernandez with her video clip, the screening of <Code Rush> at local cinema with hundreds of attendees on Soft Freedom Day turned out to be the most success events of this year. In the past, most of the core contributors of MozTW are recruited from workshops and events such as school tour. But it costs to prepare the event and contents, and it's hard if we don't have someone at desired schools to help. Also the opportunity of arranging the speech at schools are more difficult these years. Consider the costs to recruit of each contributors, it seems not a good way for us to perform. We do have a contribute page on our website, but it's not working well, not many people join us with that page (I can't even remember any), it's obviously we need to be more active on recruit. We tried recruit new contributors at several offline events, we prepared a questionnaire with the option to choose from website, l10n, arts, campaign planning and programming, trying to target the different contribution field of portential contributors. Then we could point the appropriately project for them to begin. It's kinds of offline version of "What can I do for Mozilla". We had not focused on programming before, this year we began to recruit students to try the good first bug, with the help from Thomasy, (whom is Mozilla rep) and Kenny (The web specification guru), and we had several success cases on that. Another trial I performed last month is set a booth on an Donjinji event (which named comikon at many country, the spare-time comic-er exhibition), displaying illustrates of Foxmosa and Browser Pairs game, try to recruit voluntary illustrators, I indeed got many attendees sign-up for more information, but not getting active contributors yet. But just like recruit programming students at OSS conference, I think to target the specific audience is one of the possible solution to decrease the difficult of recruition. We may faced many challenges and decisions made to try hard on evolution, at least, we survive and I'm standing here to share our experience with all of you. It may be a hard year for me to try, and to explore to be a competent community liaison, but it seems we still alived good, maybe we're doing better than I wonder? and to helping users browsing happily, social with their friends and to realizing their dreams online. and I know, in the mean time, we're also growing ourselves. according to our core values, and to our users' best. and I know the cooperation will be our strongest support for now and ever. That I can proudly to said I was in the project, and I'm the lifetime Mozillian. and to share our successful experience with all you my friends here.